Bali Spa This is built in the slightly elevated hill of Nusadua, and the Amerta Spa is the Bali's first specialty spa of Cream bath and Facial. 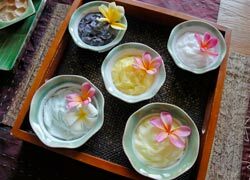 There are several kinds of Creams for Cream Bath, and you can choose according to your hair condition, such as for normal hair, refresh head, luster hair, and damaged hair, etc. 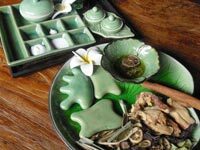 Guasha is Chinese traditional old wives use jade gemstone and board of buffalo horn to rub skin with oil, and stimulus and move bad blood to surface of skin in order to remove toxin in the body, “Eastern style Detox.” Actually, this Guasha Therapy was brought to Bali, and at home, Guasha Therapy is utilized using by coin and edge of china spoon. 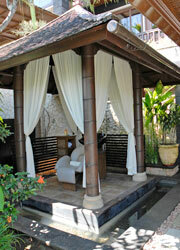 The Amerta is the first spa in Bali that creates the original massage with Guasha! After warming and pressing body with Indonesian Herbal Ball, massage lymph with Aroma Oil and use Guasha to remove stiffness of neck, shoulder, and back in order to improve body metabolism. Applying Guasha to back to activate the internal organs and improve self cure system. 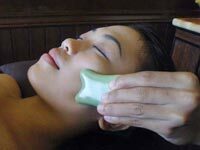 Apply Facial Massage and massage mimic muscles, plus use Guasha to lift up face and remove body wastes. Apply Bioptron to improve skin immunization system and add amino acid, collagen, and hyaluronic acid lotion; at the same time, stimulus arm lymph. 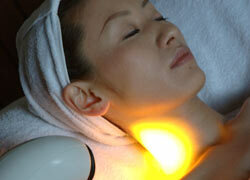 Seek sharp face line and smooth and moistured healthy skin. that results in the appearance of small red petechiae called 'sha', that will fade in 3 to 7 days. The guest can't take Guasha treatment who has fever, skin disease dermatosis, acne skin, less 3 month after take guasha treatment, pregnacy, under treatment for teeth. The guest can't take Bioptron who has Sunlight allergy, pregnacy. When you take facial treatment please take off contact lens. 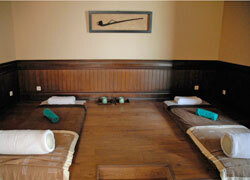 It eases tension of the muscle and nervousness to improve lymph circulation. Bioptron is a kind of rays to be included in in a sunbeam. By what gentle light iiradiates it with, it promotes the relaxation of the physical whole body and raises natural health / immunity power. In addition, there are a pimple and the lift up effect that are hard to be cured and is effective to have flabby wrinkle of the whole face! Furthermore, I relax the hard part of the muscle and ease the stiffness of the scruff and the shoulder, and there are various effects. The guest can't take Bioptron who has Sunlight allergy, pregnancy. When you take facial treatment please take off contact lens. The ion appearing from gold promotes the blood circulation, and there is a work I raise metabolism, and to activate a skin cell and is effective for the prevention and improvement of a stain / a wrinkle / the slack. As for the gold, what is hard to be absorbed by skin is considered to be a difficult point generally, but I use opto-Ron (a visible ray), and by seeps on skin in The Amerta. ※Not available if there is not stock for gold. Please contact before booking. 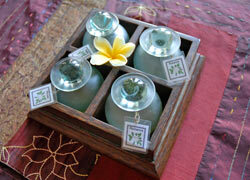 The massage with Indonesian herbal ball ease tension on the muscle and nervousness which improves circulation of the lymph. 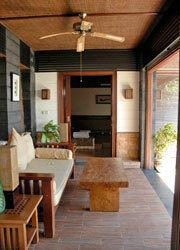 Stay at Private Villa 5Hours 30minutes. 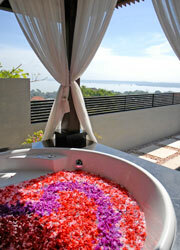 After massage, please choose cream bath & Cream Bath & facial or foot massage. 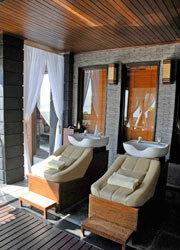 After massage please choose facial or foot massage. 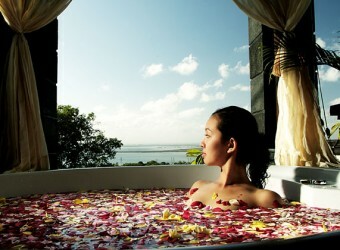 Shirodara and cream bath lead you to relaxation world. 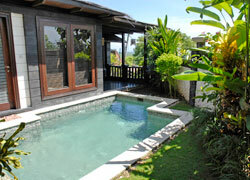 The 2 villas with private pool and the great view of Benoa Port are available one couple for each a day! It is only ＄225 to stay there from 10:00am to 10:00pm, and you can have the treatment for 6 hours including light meal and fruits. It is for your last day after checking out hotel!! Please book it in advance, since this plan has been popular since it was on TV. 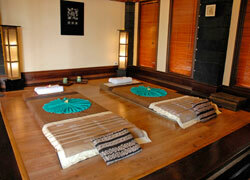 ★ Accompanying children under age 5 years o;d can stay for free. The menus for accompanying children is available. Please contact us for more information. Accommodation from 10:am to 10:00pm. 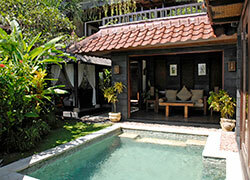 The maximum 12 hours stay at private villa with pool. From 10:00am to 10:00pm. You can choose start time between 10:00am and 1:00pm. Please let us know pick-up time. Please choose treatment for 6 hours following below. 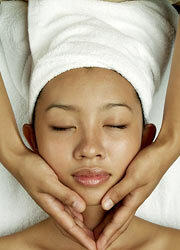 ★Gold Magic Facial (2 hours) is available with additional ＄50! 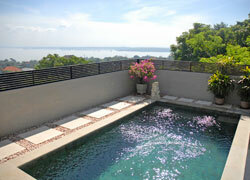 Pick-up free only in Sanur, Kuta, Nusa Dua, and Jimbaran. Free drop-off to the airport is avairable. 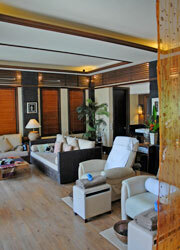 Children can wait at the lobby or the treatment room during parent's treatment. 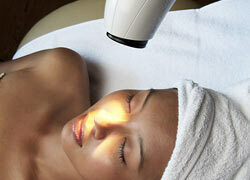 The treatment for children are also available for over age 12.
who are sun allergic and pregnant. ※Guasha cannot be applied to the person who is in below. Have fever, dermatitis, pimple, fracture, and who is in less than 3 months after opetation and straightening teeth. It was the first time for me to have facial in years. I had a very rough skin because I didn`t do daily skin care at all. I recommend you light makeup when you go out. I had facial after a long time. My skin was quite rough because I didn’t have regular skin care at all. Light make-up is recommended.